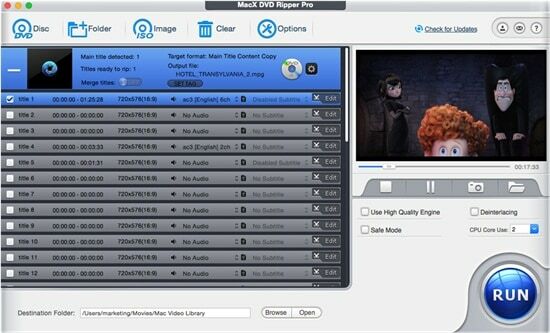 Mac users may be obsessed with extracting the audio streams from DVD movies so that they can enjoy the class dialogs or movie soundtracks on their MP3 player. Here the best DVD audio extractor software is shared to rip audio MP3, AC3, AAC from DVD on your macOS. 1. How can I extract a part of audio from a DVD film to MP3 in order to store it on my iPhone 6? 2. I love all the songs in this film. Is there any DVD audio extractor which could give me a hand to gain audio for playing on the go? Plus, I'm a Mac user. 3. I was wondering if it is possible to copy the audio from a DVD menu to an MP3 file without hurting the DVD. 4. I want to extract a certain beautiful section of music from a DVD video file for my friend's mp3 player. I will be very appreciated if someone can tell me how to convert the DVD files to MP3. As for now, such questions are around us often especially when some new wonderful DVDs are released in the market. Except for simply reviewing plots and actors, some of us are more focused on unforgettable music in the physical movie, no matter it is the theme song or episode. Needless to say, many of these soundtracks have become classics at last and are favored by people regardless of which era they belong to. But the good news is that today we have opportunity to aid music fans who are seeking for guides about how to extract DVD audio to MP3, AC3/DTS or AAC for limitlessly playback on iPhone, iPad Pro/mini/Air, Galaxy, HTC, Sony, Huawei, and other media player, and of course, the most practical DVD audio extractor for Mac is shared as well. We list these songs in chronological order and it's not to say the last one is not as popular as the former. Just because the former songs are more close to us. Besides, "My Heart Will Go On" from Titanic is made as the most impressive one even today because of beautiful melody and touching story contained. For those songs you haven't listened but have a great interest, downloading them with the assistance of YouTube video downloader for Mac or watching directly online is the fastest way to enjoy. Without doubt, those songs will arouse your interest to find the movie DVDs for extracting original audio as well. Go to check the hottest soundtracks of new movies on DVD, which is worthy of extracting to MP3 or other audio streams with an excellent DVD ripper for Mac. Once find your desired DVDs, how to extract audio from DVDs becomes an urgent work need to be solved. Generally speaking, MP3 is the most widely used audio format which is supported by all computer systems and all mobile devices ( iPad, iPhone, Apple TV, Zune, Mobile Phone, etc. ), various DVD players and some car stereos. This is why there are questions like "how to extract DVD audio to MP3", "Mac DVD to MP3", etc showing on Yahoo answers. 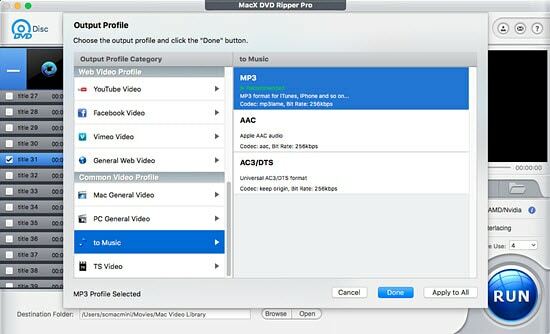 Surprisingly, MacX DVD Ripper Pro, known as a pretty useful DVD audio extractor Mac, is capable of freely extracting audio from DVDs to MP3, AAC and AC3 on macOS (Mojave included). Therefore, you can enjoy songs on the move without any limitation. Then, just follow the below steps to handle this DVD audio ripper. Free download this audio converter Mac and launch it, then insert your favorite DVD on the DVD-ROM and load your DVD through "DVD Disc" button. Alternatively, you can hit "DVD Path" to import the DVD you want to rip audio from. In the output format area, select the target format "to Music"->"MP3","AAC" or "AC3". Tips: You may notice the multiple output video formats displayed on drop-list, such as Apple Device, Android Pad, Microsoft Device, YouTube Video, etc which are all available for you if you want to convert DVD to MP4, DVD to iPhone 6, DVD to MOV, DVD to Galaxy Note 8, etc. Click the "Browse" button to choose the destination folder for saving the output MP3 files. Press the "RUN" button to start to rip copy protected DVD to audio on Mac. Note: if you wanna enjoy your DVD audio on mobile devices, do not miss MacX MediaTrans, which is capable of transferring DVD-ripped audio, desipte of MP3, AAC, AC3 etc. to iPhone iPad fast without any hassle. Meanwhile, you can even trim DVD audio to ringtone with this iPhone file manager in one click. However, extracting original songs from DVD on Mac is not so complicated than we thought especially with the help of DVD audio extractor Mac. In other instances, it can help you to convert DVD to all popular video formats and portable devices, such as DVDMEDIA to MP4, DVD to MOV, DVD to FLV, DVD to iMovie, and DVD to iPhone, etc. What's more, its outstanding function of decrypting copy protection from DVDs will cater to your needs anyway. Backup and rip a full DVD to MP3 AAC MP4 MOV in 5 mins only!